Single Output, 12 to 48 Volt outputs, 60 Volts in SNP-GK6. Small footprint 2" x 4" ( 2" x 3" for SNP-G04). 15, 30 and 60 watts of affordable triple-output low voltage d-c for space and cost-sensitive OEMs. Open frame, RoHS compliant, lead-free PC card construction. Excessive turn-on current surge limited by thermistor. Overcurrent protection with automatic recovery. 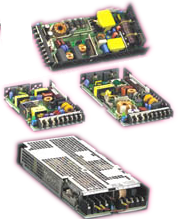 PC Card Construction, optional U-bracket and cover for 160 and 200 Watt models. SNP-E30 series: U-chassis and cover with cooling fan standard. 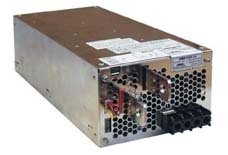 10, 15, 30, 50, 75, 100 and 150 watts of low voltage d-c for space and cost-sensitive OEMs.